We have a narow stern walk through hull that we like to back in to marina slips. The stock boarding ladder is a bit crazy for that application and we end up removing it entirely. We are thinking of removing it, putting lifelines with a gate in place for safety, and putting some sort of emergency boarding ladder on the "swim step". We boat in the cold PNW and no one is ever going to swim off this boat on purpose. I've thought of doing this myself. The major issue that I see is that there isn't very much room on the swim platform to attach one of those telescoping ladders. I guess you could mount it to your platform and then put a square piece of star board or something over top of it so you could step on it. Not sure how that would look though. We're working on something similar. We've taken off the supplied boarding ladder (cause it gets in the way of boarding the dink) and are using some stainless steel chains to provide safety in that area. 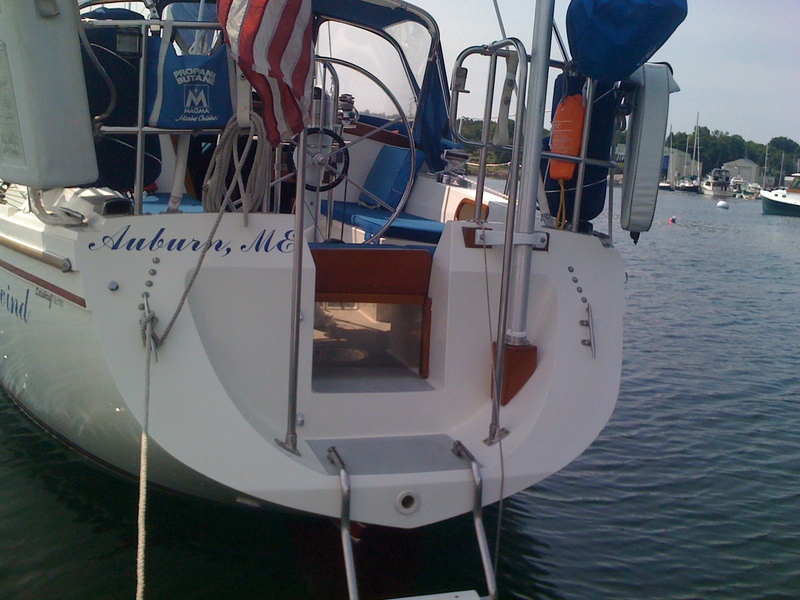 We currently have a fold up - drop down ladder that conviently mounts to the side of the boat but are currently looking for a way to attach it in the walk through transom area. I'd sure be interested in any ideas you come up with and we'll keep you posted on our progress as well. I'd eventually like to work towards the picture shown below . This is by one of our members..